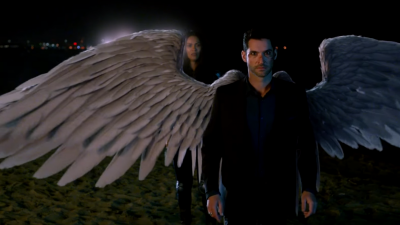 Good news for Lucifer fans. Fox has ordered an additional nine episodes of the DC Comics-inspired devilish drama, bringing its episode count to a full-season of 22. Battlestar Galactica alum, Tricia Helfer joined at the start of the current season, cast as the ex-wife of God and mother of Tom Ellis’ Lucifer Morningstar and D.B. Woodside’s Amenadiel, who has escaped from her prison in Hell. She talked to us recently about why she wanted to join the cast, what’s the best superpower, the enduring legacy of BSG and more. GeekFeed: How was Charlotte (as Mom comes to be known) first pitched to you? TH: I was actually given the script for the episode “Everything’s Coming Up Lucifer”, the opener of the second season. As you know, there wasn’t a lot to go on because she appears at the very end. But I sat down with the showrunners [Ildy Modrovich, Joe Henderson] and talked through their idea of the character and the first few episode arc that they had written, and I immediately fell in love with the character…the humor that was in the character and the idea of it. So I very quickly signed on after the meeting. GeekFeed: What can you tell us about Charlotte’s relationships with her children, and how each relationship is different? TH: We try and strip away the whole celestial aspect of it. At it’s core, it’s a dysfunctional family drama. You’re dealing with issues… yes, it’s God and his wife, and the devil and angels. But you’re really deaing with brother issues, and mother/son issues, and the miscommunication between them. Often children of divore, or just children, in general, will see something that they perceive as having happened. Maybe the parents have done something to protect them a little bit so they kind of warp the truth…so we’re dealing with that. Going into it, we definitely wanted to make sure the relationship was unique to Amenadiel [D.B. Woodside] and Mom, and Lucifer [Tom Ellis] and Mom… just like it is with any child and their parents. Amenadiel was the one that carried her down to hell. So there was definitely more animosity between the two. Lucifer obviously had a lot of anger towards his mom because he thinks she didn’t stand up for him. The whole time she was in hell he never spoke to her once so there was a lot to work through. Initially they were closer, so he was the first to accept her and want her to stay around. GeekFeed: What are your thoughts about Season 2 so far, and what can fans expect to see the rest of this season? TH: The first part of the season – in terms of my character – Mom was a bit of a fish out of water. She obviously knew about humanity, but some of the intricacies of being human escaped her [laughs]… so there was definitely a lot of situational humor and fun that Mom was dealing with and kind of getting settled in. So the first half of the season is her getting settled into this “flesh sack” as she calls it. But as we’re going along, then once she gets more settled…you start to see more of mom’s plan settle in. So in the episodes we’ve recently shot – episodes 8, 9, and 10… around there – mom definitely is settled in. She’s figured out how to do her role as Charlotte, and has gotten back into Charlotte’s life at work, and uses that to her advantage in terms of trying to get back her goal… of being to get back to heaven. So more of Mom’s plan starts to formulate, and you get to see more of, not only a maternal side of Mom… but also more of, maybe, a manipulative side of Mom coming out. So while she was a fish out of water to begin with, she’s definitely more steady and sure of everything now and gets to be a little more mischevious now. She’s definitely been fun to play. GeekFeed: You do television, film, as well as voiceover work. How do you approach each different role you play – whether it’s prepping for a character with a lot of layers like Charlotte on Lucifer, your character on Powers, or any of the other projects you do? GeekFeed: Do you like doing accents? Do they come easily to you? TH: No. Not at all. [laughs] I’m pretty terrible at accents. I have to really study them. Southern is pretty easy for me. I did that for Killer Women… a very light southern. The standard ones – the ones you hear them a lot – are easier to get into. But no… I’m not a natural with accents. GeekFeed: Let’s shift gears and talk about another comic book-related series you’ve been on recently – Powers. On Powers you play FBI Special Agent Lange. Did you explore the source material before you took that role? TH: I was familiar with it… but I had not yet gone through all of them. It was the same with Lucifer…although my [Lucifer] character wasn’t in the comics. I think Powers was closer to the source material than Lucifer. I had done a little research on Powers, but I couldn’t find too much on my character. So I focused more on the script than the character itself. Knowing I was going to turn into a cat… my alter ego was “Lynx”…and I have a lot of rescue cats, so I was very ticked to play that character. It was so much fun trying to subtly add in a few “cat qualities”… especially in the episode where she does turn into Lynx. GeekFeed: What superpower do you think would be great to have? TH: I think being able to teleport or get somewhere without having to go to the airport or drive anywhere would save a lot of time. You would have a lot more free time. I could magically appear in Vancouver for filming. Wrap. And then magically appear back home in L.A. [laughs] That would be very convenient. GeekFeed: You’ve worked in several genre shows at this points. I’m sure you done your fair share of conventions. Do you enjoy going to conventions… doing panels… interacting with fans? TH: I do. I think the panels are my favorite part. Just getting good questions and getting to share a little behind-the-scenes and stuff like that. I don’t do a lot of conventions… more so when I’m not filming because it’s easier to plan then. I hate to sign on to something and then have to cancel at the last-minute because the filming schedule changes. But yes…I do enjoy them. The fans are the reason I’m still able to do what I do. And genre fans seem to be really loyal, and will check out other projects that you’ve done. So I love getting out and meeting the fans and getting to interact with them and hear a little about their stories. It’s a pleasure. GeekFeed: I would be remiss if I didn’t ask you about Battlestar Galactica. Why do you think that series has had such an impact on people over the years? TH: It’s a show that still holds up. It’s a show about people. At the time we were shooting there was a lot of unfortunates stuff happening around the world…very much like now. Different, but very much like now in terms of the news. And it’s depressing, quite frankly. And it’s hard. And it’s hard on a lot of people. Yes…it was sci-fi based…but I think it really hit home because you could watch it and it was entertainment…but it had such relevance and it had such human emotion and drama and connection that I think it really hit home to a lot of people. Talking about conventions… having been able to have gone to conventions and meet fans directly I’ve heard from a lot of them how Battlestar helped them through a tough time in their life. I’ve talked to some people dealing with my character “Gina” on the show. She’s tortured and went through some really tough things in captivity…and I’ve heard people say that it helped them go through therapy and get help with some things that have happened in their lives. So I think it was a show that hit a lot of people to the core. GeekFeed: “Gina”was my favorite incarnation of Number 6. She is such an interesting character, and your portrayal of her was very powerful. TH: Thank you. I hate to say it, but I was very happy to get that character. Up to that point we’d seen Caprica 6 and Head 6 and I was getting a little tired of all the slinky…and the red dress, and I wanted a little more meat. So as an actor I was very happy to see that character brought in. GeekFeed: You’re still in production with Lucifer. What’s coming up for you after that wraps? Any other projects you can share with us? TH: We still have a couple of episodes left to go on Lucifer, so I’m booked up on that through the end of the year and maybe a little bit longer. There’s a couple of irons in the fire. There’s a series of books I’ve been trying to get made into a series called Heartsick based on the books by Chelsea Caine. I’m trying desperately to get that done because it’s an amazing group of books… international best sellers and it’s a character I’d love to play and a story I’d love to do. So hopefully we get that going. But that’s what I’ve been trying to get going behind the scenes. You can catch Tricia Helfer on Lucifer each week on Fox. The series airs Monday nights at 9pm.